in ALL caps: Who's the fool? My two loves are music and technology. In my day job, I write software. I've been writing code for over 13 years professionally. Before that, I would write little scripts on a TI-99/4A for fun. My first application was a program that would take your questions and answer you with a yes/no/maybe answer. Like a virtual Magic 8-Ball. This was needed because I didn't have many friends, and talking to my computer allowed me some basic interaction skills. Honestly, I think even now I'd prefer my social interactions to be behind a computer keyboard! I've often thought of starting a tech blog. Something along the lines of a Mashable or a Mental Compost perhaps. I may, one day, expand our inALLcaps brand to review books, movies, and gadgets. Until then, it's exclusively music. I am going to blend the lines a bit today and mention two cool technologies that tie into music. Well, it ties in once you understand the context. A friend of ours came into town from Seattle (or just outside Seattle... /wink) for a bit of vacation time. They ended up staying at the Hard Rock Hotel and Casino. The story goes that in their room were two large framed photos on the wall. One was a montage of photos of the band Fall Out Boy. The highlight was a picture of Pete Wentz peeing. 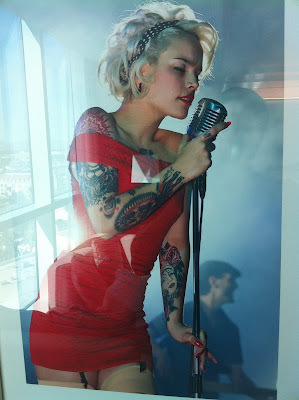 The other picture was of a beautiful blond frontwoman, in a tight red dress. Here is the picture he took with his phone. He showed me this picture while we were drinking at the Griffin downtown. I really wanted to know who this blonde bombshell was, as did he, but I had no clue. The next day he posted the same picture up on his facebook wall. I was again intrigued, and thought about how I could figure out who this hottie was. I remembered an article I read somewhere about reverse image searching. It's popular in the retail sector. Someone with an app like Amazon Pricecheck could snap a photo of a product for example, and the app would try to determine what product in Amazon's inventory matched your photo. I've used the app and found it to be very hit-and-miss. This proves that the technology is out there, so I jumped on google and stumbled on to TinEye. TinEye is essentially a reverse image search engine. You can submit an image to TinEye to find out where it came from, if modified versions of the image exist, or to find higher resolution versions. TinEye regularly crawls the web for new images, and we also accept contributions of complete online image collections. To date, TinEye has indexed 1,953,157,319 images from the web to help you find what you're looking for. This looks EXACTLY like what I need to ID this image. I upload my friend's photo, and within a second get returned some results. With another click I verify that this is Vinila Von Bismark from the rockabilly band Vinila Von Bismark & ​​The Lucky Dice. I'm also able to get access to a higher resolution image of the singer. Vinila Von Bismark appears to be from Madrid and also seems to be a popular DJ. I don't sound confident because I could find barely anything on google about Vinila that wasn't in Spanish. If I trust Google Translate, another great technology, then it appears that she is actually a he! The more google results I found and translated, the more I think it is not a language translation error. I'M A MAN from Gustavo Lopez Mañas on Vimeo.